This is “The Nature and Regulation of Real Estate and the Environment”, chapter 14 from the book The Legal Environment and Government Regulation of Business (v. 1.0). For details on it (including licensing), click here. 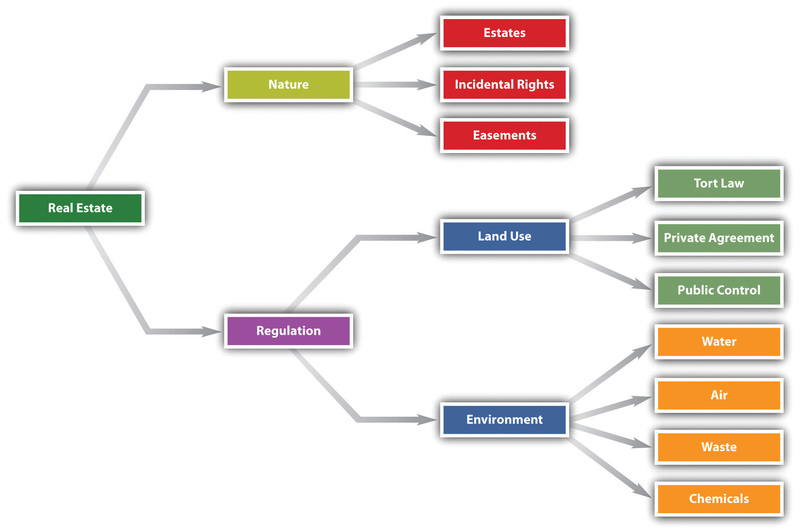 In this chapter we focus on regulation of land use and the environment (see Figure 14.1 "Chapter Overview"). We divide our discussion of the nature of real estate into three major categories: (1) estates; (2) rights that are incidental to the possession and ownership of landfor example, the right to air, water, and minerals; and (3) easementsthe rights in lands of others. The right to determine how bodies of water will be used depends on basic property rules. Two different approaches to water use in the United States—eastern and western—have developed over time (see Figure 14.2 "Water Rights"). Eastern states, where water has historically been more plentiful, have adopted the so-called riparian rights theory, which itself can take two forms. Riparian refers to land that includes a part of the bed of a waterway or that borders on a public watercourse. A riparian owner is one who owns such land. What are the rights of upstream and downstream owners of riparian land regarding use of the waters? One approach is the “natural flow” doctrine: Each riparian owner is entitled to have the river or other waterway maintained in its natural state. The upstream owner may use the river for drinking water or for washing but may not divert it to irrigate his crops or to operate his mill if doing so would materially change the amount of the flow or the quality of the water. Virtually all eastern states today are not so restrictive and rely instead on a “reasonable use” doctrine, which permits the benefit to be derived from use of the waterway to be weighed against the gravity of the harm. This approach is illustrated in Hoover v. Crane, (see Section 14.6.1 "Reasonable Use Doctrine".Hoover v. Crane, 362 Mich. 36, 106 N.W.2d 563 (1960). Another important distinction is made between easements appurtenant and easements in gross. An easement appurtenantAn easement that benefits the owner of adjacent land. The easement is thus appurtenant to the holder’s land. benefits the owner of adjacent land. The easement is thus appurtenant to the holder’s land. The benefited land is called the dominant tenementThe land that benefits from an easement., and the burdened land—that is, the land subject to the easement—is called the servient tenementThe burdened land—that is, the land subject to the easement. 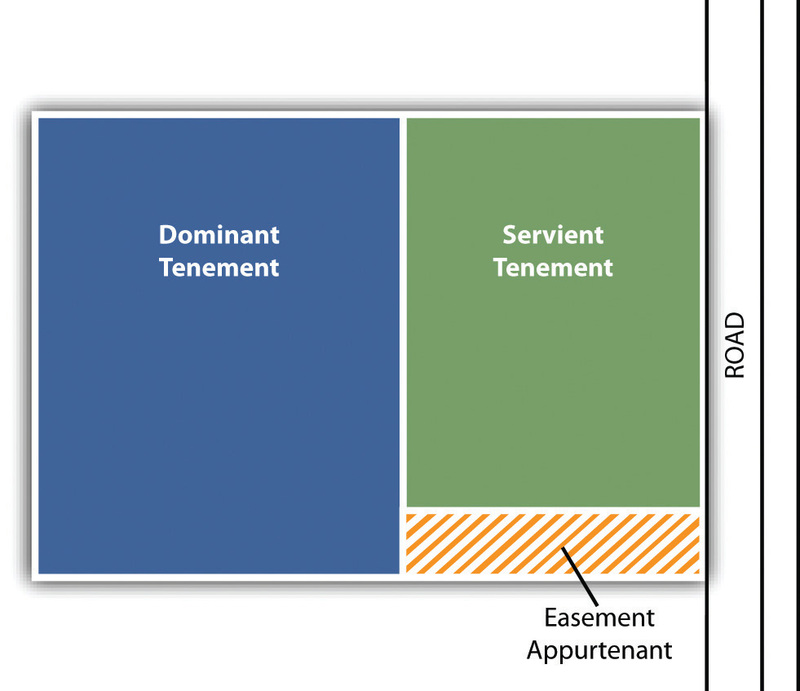 (see Figure 14.3 "Easement Appurtenant"). An easement in gross is granted independent of the easement holder’s ownership or possession of land. It is simply an independent right—for example, the right granted to a local delivery service to drive its trucks across a private roadway to gain access to homes at the other end.